In 2013, Norwich University in the UK held an exhibition of Japanese paper (washi or 和紙), featuring historical examples from the Harry Parkes collection (at the Royal Botanic Gardens, Kew) and contemporary examples from the Soul of Japan collection (Kyoto, Japan). The catalogue accompanying the exhibition - Washi: The Art Of Japanese Paper, by Nancy Broadbent Casserley - is a slim book, though it's almost unique in its focus on the art (rather than craft) of washi. 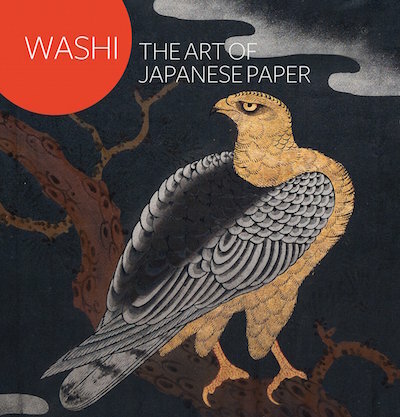 Paper-making was a significant cottage industry throughout Japanese history, and washi was used for interior decoration, clothing, accessories, toys, and packaging. It remains "a deeply evocative and significant material, craft and art form in Japan." Most of the examples illustrated in Casserley's book are decorated with floral motifs or geometric patterns, like sheets of wallpaper. Unfortunately, the historical examples are all unattributed and undated (though they're circa 1860s), and the contemporary examples are also undated.